Beautiful - even better than picture! I am so happy with this gorgeous cufflink box. It looks stunning- brilliant glossy finish, not a flaw anywhere to be seen, inside or out. Cufflinks are an important style accessory for any man who wears suits, even if only occasionally. If you've started a small (or large) collection of cufflinks, you might want to organize it in an attractive cufflink box that keeps them free of scratches. We offer a large collection of cufflink boxes that will not only look great on your dresser but also help keep your cufflinks organized and in mint condition. Your collection of cufflinks deserves a great-looking cufflink box. Why? For the same reason you don't just pile your shirts on the floor and your shoes underneath your bed (ok, maybe some of us actually do the latter). Anyway, if you like wearing nice shirts and keeping them in good shape, you'll want to keep your cufflinks looking pristine as well. Not only will our cufflink boxes help keep your cufflinks scratch-free, they'll also add a stylish touch to your gentleman's dresser. If you like the look of leather (who doesn't? 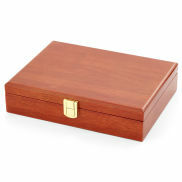 ), you'll love our leatherette cufflink boxes. We offer a variety of colors and sizes to suit any cufflink collection. The faux leather we use looks great, will keep looking great for a long time, and is very difficult to distinguish from the real thing. Most of our cufflink cases are made of wood in a variety of shades. Some have a faux leather exterior. For most cufflink cases, we offer a matching watch case, so you can store your collection of watches and cufflinks in equally stylish boxes. The interior of all our cufflink cases is lined with a scratchproof fabric. Some of our boxes have a see-through top to help you pick out the right pair of cufflinks and show off your collection. We try to offer cufflink boxes to suit anyone's taste, but if you can't find what you're looking for, please send us a quick email to let us know what you're after.